Since we’re about to lose Weather Underground and now Yahoo Weather, this should be a good alternative. NOAA Weather Service Python SDK. Contribute to paulokuong/noaa development by creating an account on GitHub. NOAA API (V3) Python 3 SDK. Severe Weather Alerts from the US National Weather Service Share your Projects! Awesome. You should turn this into a component. I have literally no idea how to do that. I think someone already did. That is just the sensor portion of the alert system. From what I can see there’s not really any more benefit to using that component than using the custom component that was already made by @eracknaphobia that I’m already using in the above referenced thread. It would still need all of the other automations and scripts there to do anything more with it. and those scripts are running flawlessly thank you very much. Too bad we have so few votes on this feature request. 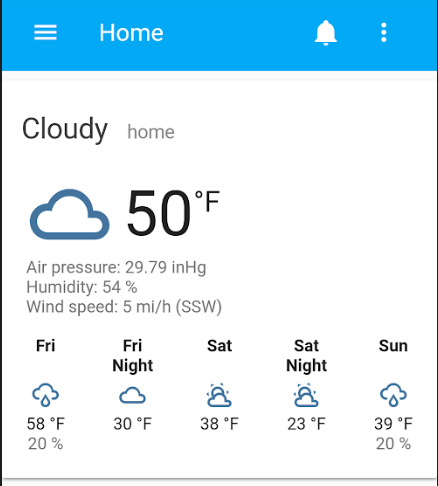 We need a lot more so it gets developers’ attention and who knows, some of them decide to write a new component for weather based on this service. I have a weather component working. See below. It probably needs to be updated to the new structure, but works in 0.89. I’ve hesitated to change it since no other weather platform had changed. I also have modified the weather card to display day/night and precipitation probability. Support for NWS weather service. I was planning on submitting a PR for this after I laid some needed groundwork by adding necessary unit conversations first. But my pressure fix PR has been dead in the water for almost three weeks.